Where did everything come from? Why are humans so biologically similar, and why do we let small differences divide us? What shall determine our destiny? Paul Singh and John R. Shook draw on the latest findings from the physical and biological sciences, astronomy and cosmology, geology and genetics, and prehistory and archeology in search of answers. As they lucidly and engagingly demonstrate, the answers science gives about ourselves and the universe in which we live are incomparably more surprising and interesting than any mythical tale about some clash of titans or calculating creator. Indeed, science’s proud journey of exploration and discovery is humanity’s finest narrative yet, about how we trusted our intelligence to find out what we really are and who we can be—intrepidly going wherever the evidence led. Even though science reveals that humanity may have no special place in the universe, humanity is truly special because of our ability to comprehend our universe. 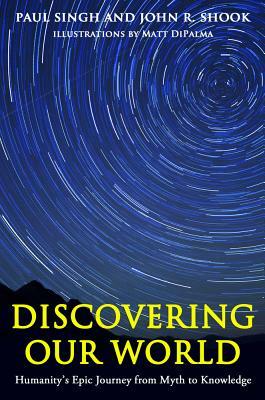 Thus, this inspiring story of exploration and discovery is a celebration not only of science—of science’s knowledge of the world, and of science’s own journeys to gain that knowledge—but also of ourselves. Paul Singh is a professor of obstetrics and gynecology at the College of Medicine, University of Science, Arts and Technology at Montserrat, British West Indies. He is the founder president of Singh Global Initiatives, a philanthropic organization that promotes health and science education worldwide. He lives in Menlo Park, California. John R. Shook is a scholar and professor who has authored or edited more than a dozen books, including The God Debates: A 21st Century Guide for Atheists and Believers (and Everyone in Between). He lives in Arlington, Virginia. Matt DiPalma is a designer and illustrator. He lives in Gainesville, Florida.